You're probably wondering how I could call a precious little girl like this a hellion. 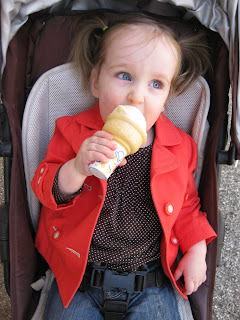 I mean look at her....she's just sitting there trying to enjoy her ice cream right?!?!?!? Well, I can guarantee you that although she seems very content this sweet little baby girl's mind is cranking and she's in the process of working up her next move. What it is...who knows???? I have to say over the weekend the word "hellion" came to mind a number of times. Definition: hel·lion - A mischievous, troublesome, or unruly person. Definition: trou·ble·some - 1. causing trouble, annoyance, or difficulty; vexatious: a troublesome situation; a troublesome person. 2. laborious; difficult. Yep. That pretty much hits the nail on the head. This definition perfectly describes our baby girl (whose no longer a baby anymore of course). Why do I say this? Let me give you some examples of things that took place over the past 3 days. I must preface that Clay and I try to discipline and set boundaries but we seem to be failing in this area at the current time. Ok...let's see...Well, I took Lola to Hobby Lobby to get some stickers and she refused to get in the basket without screaming at the top of her lungs so to avoid total embarrassment I gave in (bad parent move #1). Instead she ran through the store hiding and running from me and pulling things off the shelves. Awesome! 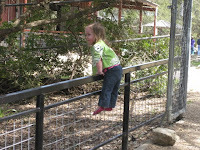 Or, when we went to the pet store to buy a fish (I was doing this to try to motivate her to tinkle on the big girl potty...nothing like blackmail when it comes to a toddler (bad parent move #2)) she instead whined that she wanted a puppy over and over. Then when I finally got her away from the puppies and inside the store, she began banging on the guinea pig's glass cage yelling "Here little rabbit, come here little rabbit" and giving a kiss, kiss, snap, snap trying to call them over as if they could get out of the cage. I explained to her numerous times they were not rabbits but she still continued to scream this so loud that there was an echo through the store. At one point the store employees began giving me evil glares. Their eyes all but saying "Get your child out of here now for the love of God!". Needless to say Lola was NOT interested in fish whatsoever so we left. Not without having to pass the puppies again though. AHHHHH!!! 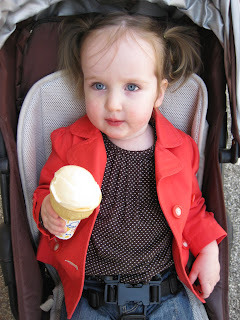 THEN, when we got in the car, she started saying "I want a fishy". ARE YOU KIDDING ME??? I told her too bad so sad that she just missed her opportunity. Another example...one morning over the weekend I was getting ready. Lola took my make-up and went to the other room. She came back with mascara all over her face. 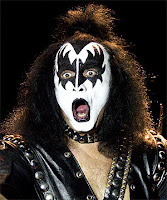 She looked somewhat like Gene Simmons from Kiss don't you think???? Ok...Not exactly but if I would have given her a little more time I think she would have. Here's the best part (or what you could also call the hellion part)....when I saw the mascara all over her face, naturally I took it way from her (good parent move #1). This caused her to throw one of her little toddler fits and she ran to the other room where Clay was. Then get this.... Clay asked her "What's wrong". Lola said "Mommy bit me". I walked in and Clay said "What happened?". I said "Nothing. 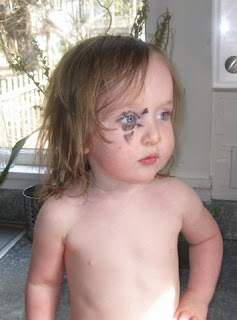 She was making a mess with the mascara and I took it away". Clay looked at Lola and said "Did Mommy bite you" and she answered ever so sweetly "No". Ok. NO SHE DIDN'T!!!! Trying to work her parents against each other but we out smarted her didn't we. Can you say HELLION!!! 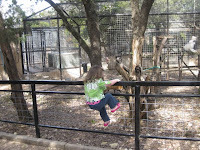 On Sunday we went to the Austin zoo and Lola was on her own mission and didn't care if I was there or not. I was chasing her all around that place for over 3 hours. 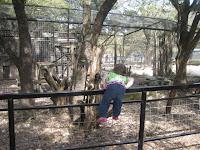 At points, I would find her climbing the fence trying to get over on the side of the animals. SERIOUSLY....I only looked away for 10 seconds, I look back and my child is almost in a cage with a fox. Lovely! Thank goodness it was a fox cage vs a tiger cage. OMG!!! You probably thought I was over exaggerating about the climbing fence thing didn't you??? Oh no. A lady at the zoo who I guess had been observing us for a while came up to me and said "She has a mind of her own doesn't she". I said "YES, to say the least". She said "That's a good thing!". My comment back was "That's what I hear but right now I'm having a hard time seeing the good part of it all". Anyway, I was finally able to trick Lola out of the zoo. She wouldn't leave willingly so I had to tell her that we were going to feed the animals again when we were actually going to the parking lot (bad parent move #3). Then when we got to the parking lot, I told her we were locked out and couldn't get back in. Lovely that I lie now. It's only to keep some sanity in my life though...does that make it ok?!?!?!? I sat Lo down to eat and she wouldn't eat of course. She said "I want to get down". I said "Not until you finish your dinner". She looked at me, took her bowl of food and dumped it out on the floor and said "I'm finished". This made me blow a gasket. I mean seriously...what in the heck should one do in this situation???? I reacted in a very mature motherly way and told her that I was VERY VERY VERY mad at her and that she was a VERY VERY VERY bad girl and not only was I not going to take her to the playground all week but she also couldn't watch Chitty Chitty Bang Bang. None of this phased her AT ALL!!! I gave up and just sat in silence waiting for Clay to get home (bad parent move #5). Even with all of this craziness and yes it is always PURE CRAZINESS in our household (lets just say she keeps us busy), I wouldn't change her for the world. This child is the sweetest thing you have ever met. Oh my goodness...my words will never be able to explain her sweetness. She'll come up to me several times a day and give me a big hug or just pat me on the hand and say "Mommy, I love you". She loves to snuggle, kiss and hug. She is really just soooooo affectionate. Sometimes she'll just roll up in a little ball on my lap and just talk to me and hug on me and tell me she loves me. Now, every parent needs this. So, if we're able to get through the crazy times (and we usually are), we know there's always this little lover bear that's going to make it all ok. Thank goodness for this. Otherwise, I'm not quite sure how I would make it through. 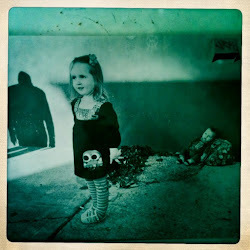 You just absolutely make my day when you blog. I think you missed your calling! I'm so proud of you as a mommy! !